My stash box actually isn’t a box at all. I came across these OCB trays at a smoke shop in the village. When I saw the sushi design I was sold. So I picked up two. 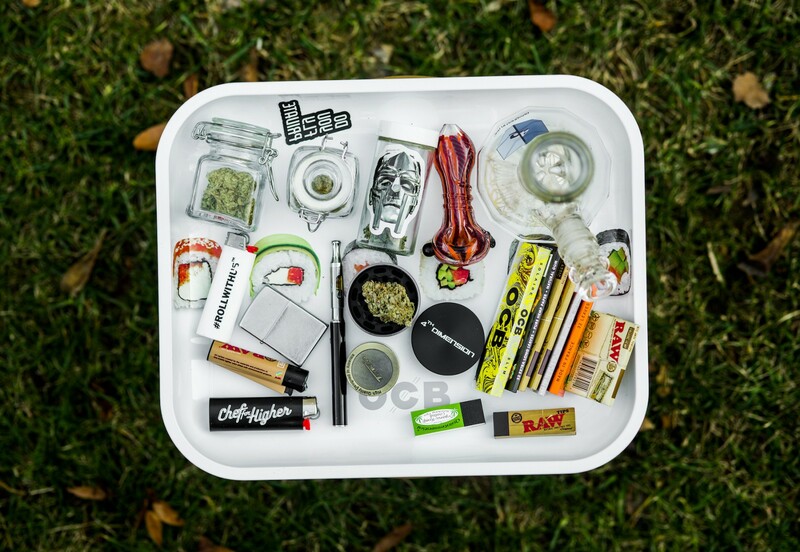 One tray holds all the goodies, and I use the second tray as a cover. It works out better for me because I like to use jars and they never fit right in my old cigar boxes. A little variety is good, so I keep a few different strains on deck. In this photo there’s GG#4, Granddaddy Purp and Sour Diesel in the MF Doom jar. Most of the time when I’m smoking by myself, I’ll smoke out the bowl or bubbler, but when I’m smoking with friends I’ll roll up some papers. Raw are my papers of choice. They burn the best. I do like to try different brands though, so your liable to find anything from Marley’s to Zig Zags. I just got into the whole cannabis oil game too. Their discreetness is a gamer changer for me. Brass Knuckles and Eureka are my favorite. I’m not into fancy lighters because people steal them (myself included), so I keep simple with a few BICs clippers and the classic Zippo. As you can see, I keep my home stash simple — no fancy gadgets here. Just enough to light up the homies or cap the night.